IF YOU WERE lucky enough to get a drone this Christmas, the temptation to start flying it immediately is pretty high. If that’s the case, you should resist the urge as there are a few things you should keep in mind first before you take to the skies. With the most recent regulations coming into effect this time last year, it’s essential to know what’s allowed and what isn’t before you take flight. Best of all, it will only take a few minutes to cover everything. 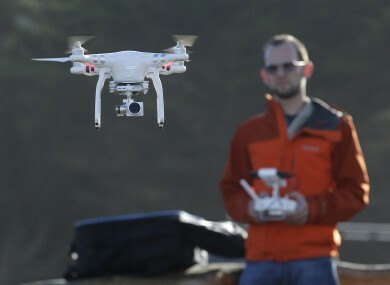 If you own a drone and it weighs over 1kg (including battery, camera and all other attached equipment), you must register it with the Irish Aviation Authority (IAA). Registration will cost €5 and will cover users for up to two years. There is no limit to the number of drones you can register. When can I not fly my drone? Flying it in urban areas, civil or military controlled airspaces. Further than 300m from the pilot. Over 400ft (120m) above ground level. Within 120m of any person, vehicle or structure not under the pilot’s control. Closer than 5km from an aerodrome. Anywhere where it could be a hazard to another aircraft in flight. If you want to fly your drone outside of those limits, you need to gain specific permission from the IAA. If you’re flying over private property, you must have permission from the landowner. Do I need training to fly a drone? You don’t. It’s expected that those flying the drone follow the rules, but the IAA recommends anyone who uses a drone to take a safety training course. It’s also recommended that you have insurance for your drone in case something happens. If a drone weighs 4kg or more, you will need training. Email “Did you get a drone for Christmas? Don't fly it straight away”. Feedback on “Did you get a drone for Christmas? Don't fly it straight away”.